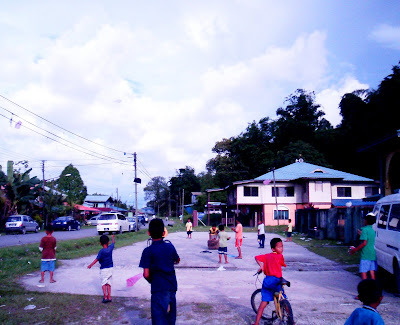 This afternoon I saw these joyful kids playing at an open space by the village of Kampung Jepak, just across the Bintulu town. where my worker lives. I took a moment to take a picture of them. I was thinking of the nostalgic days when I was a kid like them spending endless hours playing with my brothers or sisters and friends. What did I do after school hours when I was like them say at the age of 4- 12 years old? 1) Collect firewood from a nearby sawmill that was located on the opposite side of the river. It required me and my brothers to paddle a small boat . A frightening experience when the boat was loaded and had to navigate the waves from passing ships . Never did our boat collide or sank. Thanks to the Almighty. 2) Sell cakes & ice cream which entailed me to walk for miles around the village or town . Over the years became knowledgeable about Who's Who in the village or town, especially those with spending power. 3) Water plants,sweep garden floor and help burn garden debris - almost on daily basis.That could be how I was indoctrinated into gardening. Green fingers are created young. Did Confucius say that?? 5) AOB - carry out miscellaneous errands like collect clothes from working bachelors who contracted out their laundry washing to my mother. Then send back the clothes cleaned and ironed . Reflecting on my childhood days I think I had my share of the fun days as well as the 'hard' days. More of the former than the latter. I guess -Kids just wanna have fun.